Let your soiled clothes get a perfect space in stylish laundry bags of Swayam India, designed to keep your setting tidy. Pure rubberized cotton is used to design these easy to care bags. They are waterproof and detachable, thus are easy to clean. They are equipped with a foldable metallic frame. 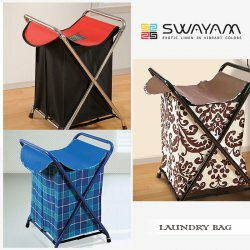 Browse their mix and match collection of laundry bags at swayamindia.com and place an online order soon to grab their current 15% discount.